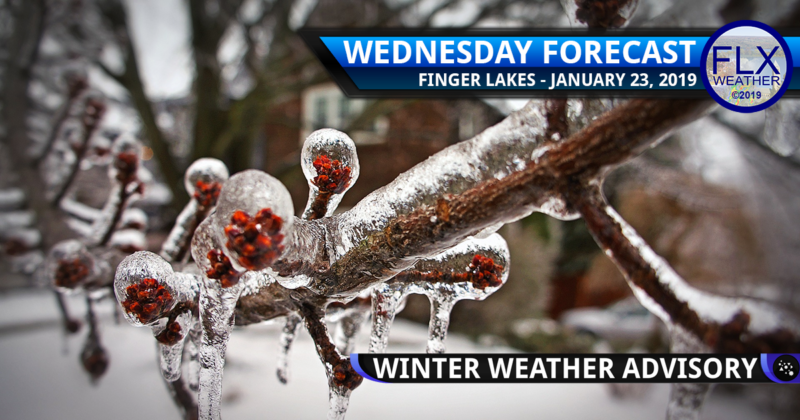 Freezing rain will create icy conditions across the Finger Lakes. Eastern areas will see ice well into the afternoon. Areas of sleet, snow, and especially freezing rain are falling in the Finger Lakes this morning as warm air works in aloft, but cold air remains entrenched in at the surface. Low pressure over Illinois this morning is pushing warm air northeast into the Finger Lakes. Since warm air is less dense than cold air, it is riding up and over the cold air at the surface. While temperatures about a mile above the surface are rising into the mid 30s, surface temperatures are in the mid 20s. Areas of precipitation are therefore falling as an icy mix of sleet and freezing rain. Slick conditions exist throughout the region, but especially in the eastern Finger Lakes and Central New York where precipitation is a bit steadier. Warm surface air will slowly spread east. By noon, precipitation will turn to rain in Rochester and Canandaigua. Syracuse, Auburn, Penn Yan, and Wellsville will turn to rain between noon-2 pm. Much of the Southern Tier and southeastern Finger Lakes, including Corning, Elmira, Cortland, and the hills surrounding Ithaca may not turn to rain until 4 or 5 pm. Downtown Ithaca itself will probably turn to rain several hours sooner with temperatures warming an extra couple degrees. Most of the Finger Lakes will see a coating of ice this morning. Areas in the southeastern Finger Lakes and Southern Tier could see more significant icing on the order of one or two tenths of an inch. Please use caution traveling today. Even a small amount of ice can be hazardous. Untreated surfaces such as sidewalks, driveways, decks, and ramps will also be very slippery. Rain showers will continue into the evening, but more widespread steady rain will begin to work in towards midnight. Rain amounts will be heaviest across the eastern Finger Lakes with a half-inch or more falling east of Seneca Lake. Temperatures will also climb to at least 40 degrees overnight. The rain and warm temperatures will help melt some snow. While not enough to produce widespread flooding, some basements may get wet and the threat for some localized ice jam flooding is possible. Those living in areas prone to ice jam flooding should be alert through the night. Rain will turn back to snow Thursday morning from west to east. Again, the heaviest snow will fall in eastern areas, where 2-4 inches could accumulate. West of Cayuga Lake, only an inch or so should be expected. Snow will end during the early to mid afternoon as temperatures retreat into the upper 20s. Blustery west winds will gust over 30 mph. Bands of lake effect snow will develop Thursday night, starting out north of the Finger Lakes, but eventually working south into the region for Friday. Lake Erie will the snow producing lake for us on Friday, resulting in a general coating to an inch across the region. Up to two inches may fall from Penn Yan to Cortland, with three or four inches around and just west of Dansville. Friday will be cool, with highs in the mid 20s and wind chills in the single digits and low teens. Saturday will be partly cloudy as winds turn to the south, removing any lake effect from the area. Temperatures will be cold, starting just above zero for the Finger Lakes and just below zero across the Southern Tier. Afternoon highs will be in the mid and upper teens. Some snow may be possible Sunday into Sunday night, but this remains uncertain. Thank you to Finger Lakes Mill Creek Cabins for their sponsorship of Finger Lakes Weather! Check out their cozy, pet-friendly cabins which are open year-round in Lodi. Visit their website by clicking here. Interested in sponsoring Finger Lakes Weather? Click here for more information. Also planning to drive to Syracuse Thursday morning and returning early evening. Any thoughts on how bad the drive will be? Thanks. Depends on the timing. Early on, precipitation will still be rain. Expect a change over sometime around 8am, give or take an hour for the different locations/elevations. Roads may get a bit sloppy after that but nothing too major, especially the main roads. Evening should be fine. Thank you. We have been dry so far though our rainy periods. Planning on driving to Syracuse Airport from Ithaca tonight at 5:30. Should I expect icy road conditions? Should be fine by then. Why do you say some “wet basements” as opposed to other rain storms? That is my worst nightmare. I have a working sump pump. The rain + some snow melt. If you basement regularly gets wet, it may again tonight. If it does not usually get wet, you will probably be fine.